While strolling…swiftly…between the family room and kitchen yesterday I caught a glimpse out of the corner of my eye. I paused and tried to focus through the rain spattered window. 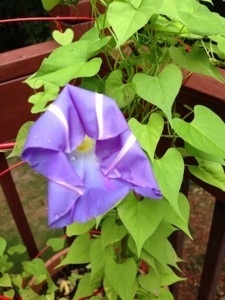 A single-fragile touch of purple amidst the green vines on my back porch. I reached over and grabbed my phone and rushed outside, with chill-bumped arms and developing tears, and clicked a pic. So here it is…beginning it’s bloom closing in the rainy evening hours. All I have to say is “Thank you Hidaddy for catching my eye and giving me a heart-tugging hug. I cannot wait to see the vines in full bloom! I just took it out of the oven!!! 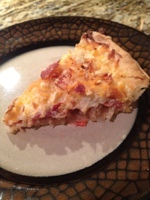 The aroma spilled out into the kitchen as I moved the Summer crop filled pie out of my oven. I can’t wait to share this amazing recipe with you! 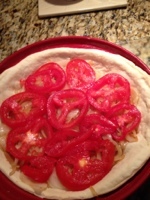 So as promised…Here it is…A taste from my Summer Kitchen Part 2. 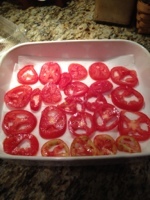 Place seeded tomato slices on paper towels and pat moisture off the slices…use half the salt and sprinkle on top of the slices to draw out moisture for about 30 minutes. 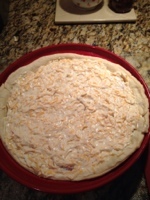 Place the pie crust in the deep dish pie pan and bake until lightly brown. Mix the 1 cup of cheese and 1cup of mayonnaise together with the remaining salt and the pepper then spread over the tomato. I used a light mayonnaise with a 2% milk cheese. 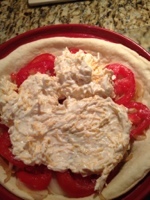 Combine the breadcrumbs and Parmesan cheese and sprinkle over the top of the pie. 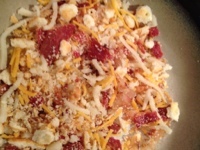 ( I used 5 Reduced Fat Ritz Crackers and Mozzarella mixed with Sharp Cheddar Cheese and tossed in the crumbled bacon. 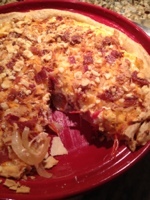 I cut a slice to show you the results…and well I only took one bite! 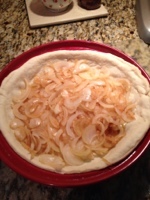 I sent pictures to my friend who shared the recipe with me yesterday…she mentioned she would have to come by and taste mine…and how she was going to use my altered recipe. 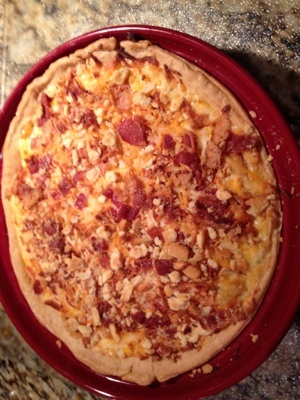 You will want to try this recipe…It is wonderful! It sits quietly on my deck as it soaks up the warmth from the early morning sun. 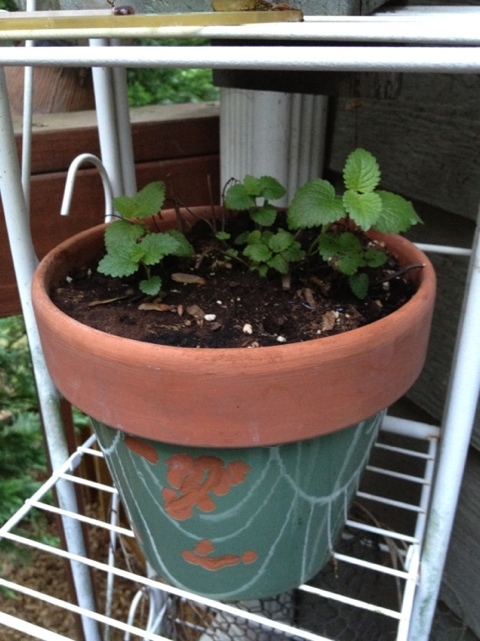 It reminds me daily to visit and shares with my family from the various stems and pots. I do love My Little Garden! 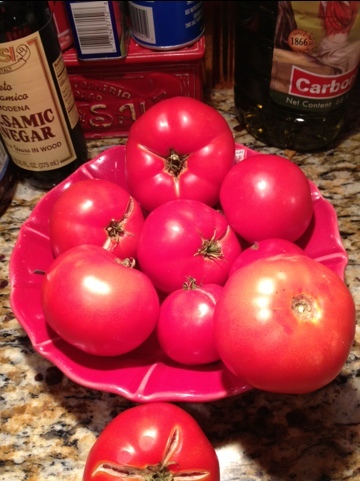 Two large tomato plants grow strong and tall. Next to the window I have a wonderful Mint! 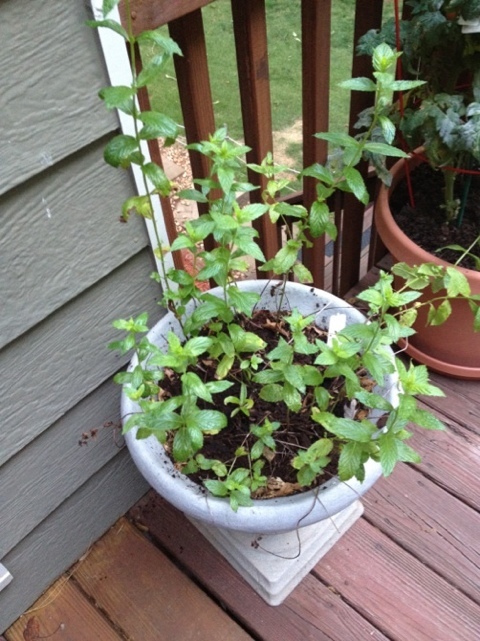 Fresh Mint is the perfect addition to my Sweet Tea. This is the fourth season with this herb. 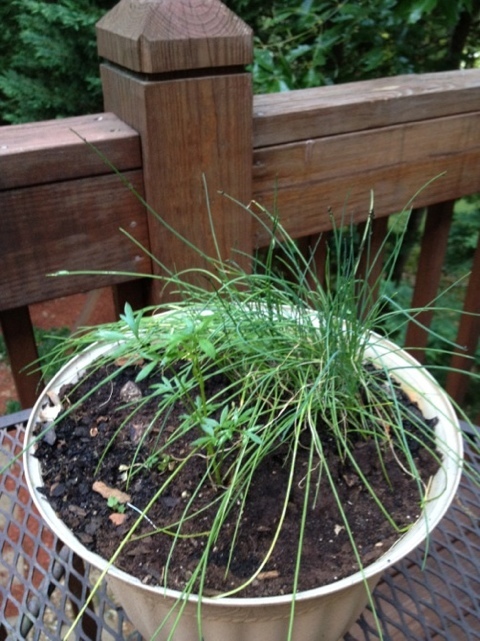 This planter holds my Chives and Cilantro and an Italian Herb. The Chives are doing well…the Cilantro is a little slow this season…the single stem Italian Herb is a snip-it I started about a month ago. I usually put this in my dressings! The experiment this season are the potatoes! 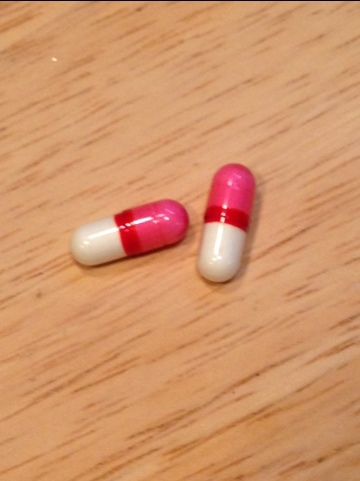 I am really excited about these and hope this works. If it does…we will start a potato patch. 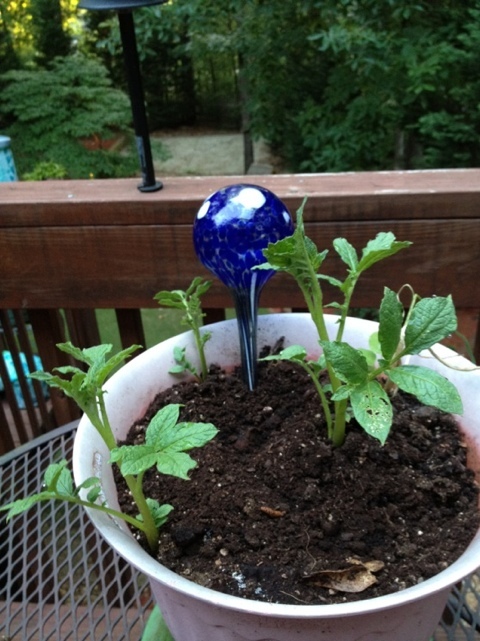 The last plant in my garden..that is not a flowering plant, is my Lemon Balm. I bought this as a started three years ago…I just couldn’t help myself…the smell is wonderful! I will be adding peppers in two weeks and maybe another tomato plant. 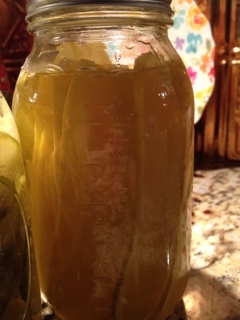 I have two friends who have larger than life gardens…I always get plenty of cucumbers and beans from them. 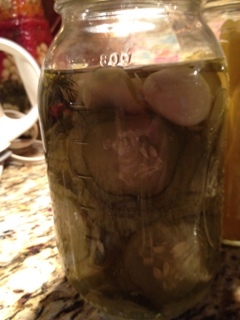 Last year I made homemade Pickles and even sold a few jars. I had slices and spears and even some relish. I am almost out! I surprised myself at how good they were. I am hoping to get some squash this year…maybe I could put some up for the winter. Well…my garden is small…but I enjoy it. Maybe one day I will be able to put a garden in the back yard! Right now my son, the Landscaper, says there is no room. I think he does not want to work anymore than he has too! My dream garden would have a Raspberry Vine and a Coffee Bean Tree. “Okay!”. Give me a little credit…”I was thinking how wonderful it would be to simply have an unlimited supply of already roasted Coffee Beans.”. Silly me! What would you grow in your garden? What tricks and methods do you use in your garden? I am always looking for ways to improve My Little Garden! Have a great day! Peach State says: It’s Time for a Little Light Cooking! Here we are…at the first of the month and the beginning of a different season. It is time to leave behind the heavier comfort foods of the winter and bring out the lighter recipes! I was cleaning up the kitchen first thing this morning because of the grocery shopping later today. I got a little side tracked and began sorting through my recipes and doing a little menu planning. It’s Time for a Little Light Cooking! 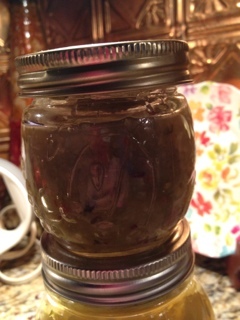 Sauces and Dressings add so much to a meal and help me keep dinner different. 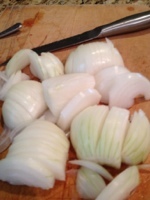 I use this sauce over a Cajun Pan Fried Chicken…(see picture above) My family loves this recipe! I serve with Asparagus and Bruschetta topped English Muffins. 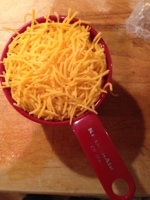 Whisk together 3/4 cup of water, 3/4 cup of plain Greek or regular Yogurt, and 1 packet of Broccoli Cheese soup mix in a small saucepan. Bring to a slow boil on medium heat. Simmer for 2-3 minutes. 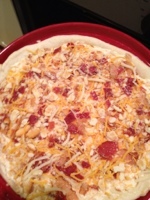 This recipe can be altered to different recipes! This is the basic one my family uses. Lime juice can be added to this recipe as well as Mandarin Orange syrup or juice…separately of course! 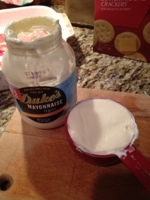 I use this dressing over my Pulled Bar-B-Que Chicken Salad! I boil the chicken until tender…and then pull and shred it. I then add bar-b-que sauce to the chicken. The chicken will be placed on top of the salad. This is a huge main course salad with tomatoes and Mozzarella Cheese and pretty much anything you like on a salad. 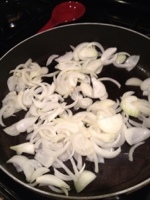 I make fried onions to garnish the salad by coating sliced red onions in flour and Cajun seasoning and frying until lightly brown. I love salads…it’s probably a good thing because of my dieting! 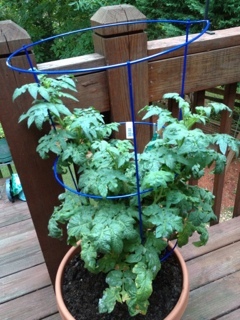 With all of the fresh tomatoes and herbs I have growing on the deck…this recipe will be a great addition. This recipe is for an individual serving! This is a new one for basting chicken. I love to roast chickens and this sauce is very easy! Pat the chicken dry and season with Italian seasonings and salt and pepper…half way through your cooking time baste the chicken with 1/3 of the Orange Sauce and continue roasting. I serve with rice accented with the remaining Orange Sauce and Green Beans…and a lovely salad! Well I have some coupons to gather…and need to complete my menu planning …after all…It’s Time for a Little Light Cooking! 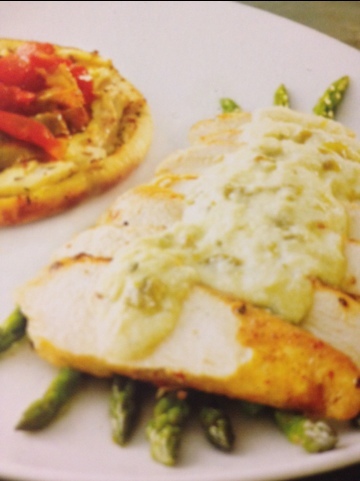 What are some of your favorite spring and summer menus? Please share…I do love to try new things…on my family! Have a great day! Peach State says: Mornin’ Glory! A vivid group of memories, from my childhood, came rushing to the forefront of my first moments of conscience this morning. It was a sound that triggered the initial flash…a dog was barking…”No! It’s to early!…What is that sound?” I stopped and turned my ear towards the window closing out the sound of my pounding heart. There is it…FLASH! “Do you see it up on that branch?” I was standing next to my grandfather in the backyard of his little house outside Birmingham. I was looking up at a large bird with round yellowish eyes…it was the biggest owl I had ever see. The forlorn sound coming from this magnificent bird was unlike any I had ever heard. My grandfather just smiled…”He is saying “Mornin’ Glory!“…”Really?”…”He likes the color of your eyes too!” My grandfather said my eyes were as blue as the Morning Glories in his yard. I was about 6 years old! This flood of aged memories continued as I reached for my mug to fill it up with my first taste of coffee of the day. My grandfather had a green recliner with a striped pattern down the center. A small table sat next to it with a lamp behind it. He loved his morning coffee too and sipped on it as the scent of breakfast floated through the house…the clanking of the skillet on old gas stove, as my grandmother cooked, was soon met with the voices of my parents looking for me. “She’s with me!” my grandfather said…”We were up early today!” I chuckle to myself this morning as I remember that statement. Was it the fact that I got up to early and my grandparents heard me and got up…or were they already up? I can remember the items next to his chair…he had a pipe stand with two pipes and a container with his pipe tobacco in it. 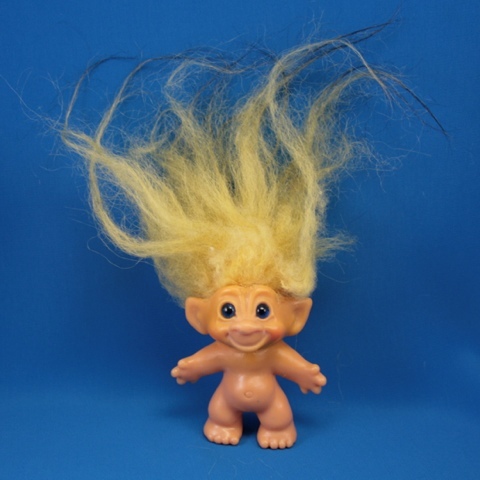 There was a book…a first reader from his childhood that I learn to read while sitting in his lap…and a doll…a troll doll with yellow hair. The many hours of reading and playing with that fuzzy headed doll were filled with so much love. I keep these memories in a very special place in my heart. The book is in my office next to my desk. The troll doll got lost during a move. 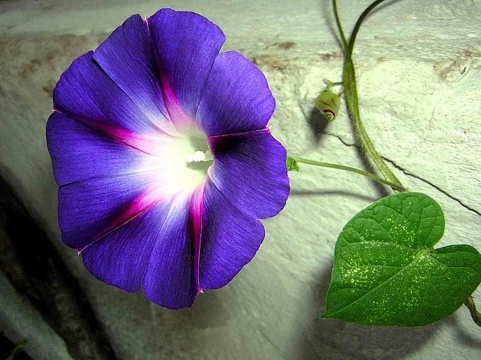 I still have blue eyes…and still love Morning Glories…but no one has greeted me by saying “Mornin’ Glory!” since my grandfather passed away. I was 11 years old! 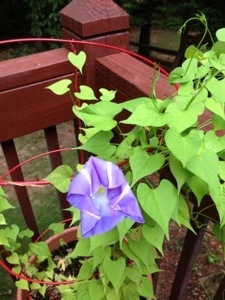 I think I will try to find some Morning Glories to plant in my yard. Have a great day! Peach State says: It’s Spring Break! 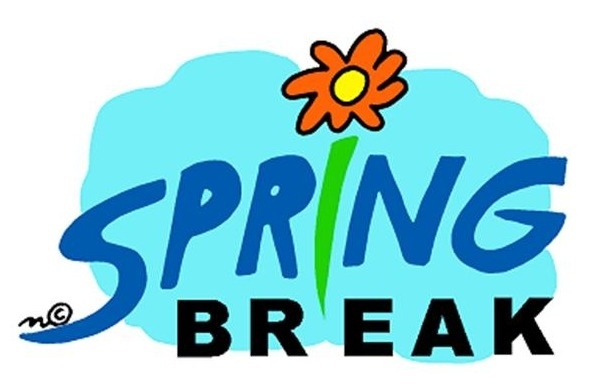 Reasons I am glad It’s Spring Break! Less time on the road! Most people have left town and there is no traffic! Shopping is easier and quicker! Can get gas at the gas station! Most people have left town and no waiting to get gas…just have to have lots of $$$! 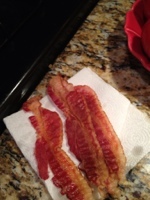 Who am I kidding…hubby still going to work! No practices at church…but practices will be at a friends house…one one doctor’s appointment, family haircuts before Easter…shopping for Easter clothes…I need shoes! Alright..so maybe it is not the ideal stay at home vacation! I will be able to spend time outside today…pulling weeds! What a nice way to have quality family time…no son that is not a weed! I will start my vegetable garden this week and maybe buy a few more flowers for color. Reminder…make nail appointment for later in the week! 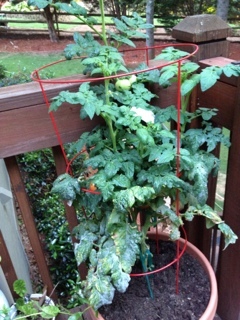 “I do love playing in the dirt…without gloves!” I will have help from two sons as I clean out the old dead plants and replace the soil…I can taste the fresh tomato sandwiches already! Sorry..I just had to have something beachy to look at! I will be content to enjoy my quiet unscheduled days at home. No son! Stop running in the house! Calm down! Leave your brother alone! Quiet, relaxing days at home! “What is that?” It’s Spring Break! 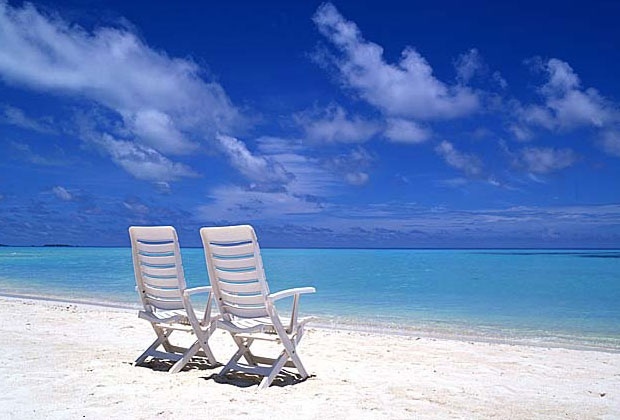 How will you spend your time off? Will you spend it with friends and family? Mine will be good…with friends and family you can’t go wrong! Have a great day! Spring has finally started to change the look in my yard. The grass is a grayish dead with bright green patches scattered around. Sadly the green patches are weeds! 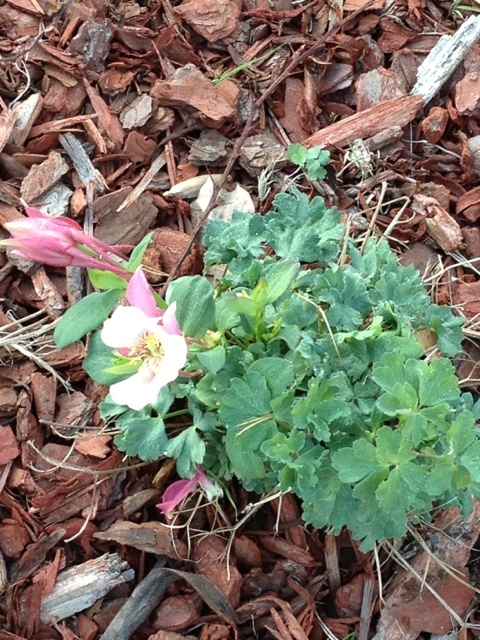 The plants in my yard are showing life after their short winter sleep. I took a few pictures while outside yesterday. I was so excited to see these signs of life, when I took the trash cans out to the street, that I had to grab my phone and snap these. 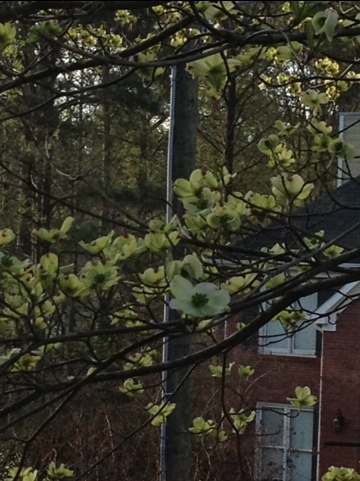 The Dogwoods were filled with closed buds Sunday but now…well see for yourself…Spring is in Full Swing! 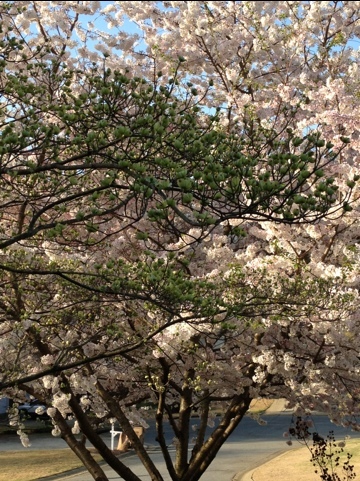 The Flowering Cherry Trees are exploding in varied shades of pink with fluffy, snowball shaped blooms. 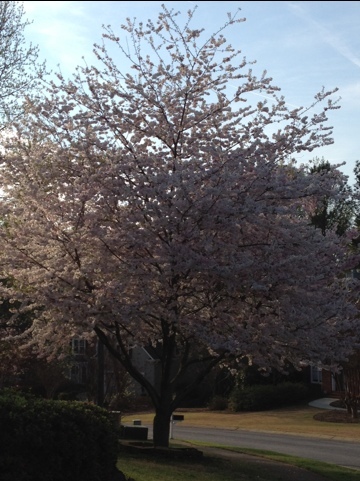 These trees have started blooming along the streets of my neighborhood and it is like a snow flurry as the blooms give way to the bright green leaves. I wish I could have taken a picture of the deck yesterday morning. The stained boards, usually aged dingy brown, we’re covered in a bright yellow haze that suddenly appeared in a few hours. The warnings have been all over the news due to the extremely high pollen count. 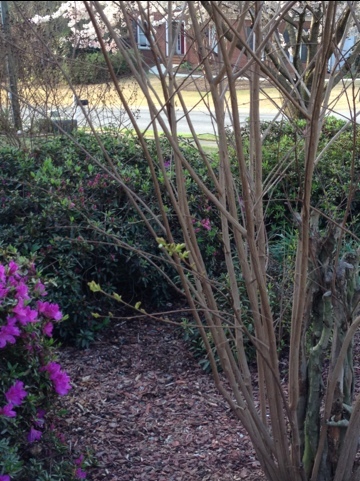 The small green leaves are sprouting on the Crepe Myrtle Trees and will be in full bloom this Summer. The Azaleas and Rhododendrons are covered in buds and are starting to show their true colors. The assortment of purple, pink and red flowers look like a “stadium wave” as the blooms move through the front yard from bush to bush. Spring is in Full Swing! With my Benadryl taken and latte’ in hand I will leave you for now. I am in defense mode now and have to get a grip on the crippling symptoms headed my way from the pesky particles of pollen. 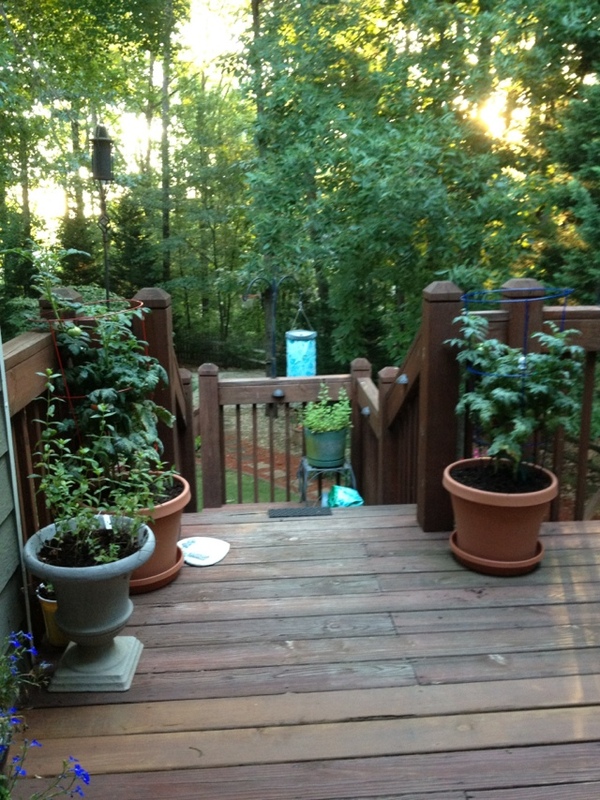 The sun has risen and the yellow haze is not the sun’s glow…pollen! Have a great day and don’t forget to look around you…you will see Spring is in Full Swing!